Sony has said it will resume some services on its PlayStation Network, which was shut after the theft of personal details of about 77m users. Sony officials said they had boosted the security of their computer systems after user names, email addresses and log-in details were stolen. 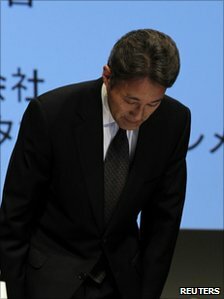 Executives, including Kazuo Hirai, the head of Sony’s PlayStation unit, apologised for the security breach. The theft has prompted legal action and investigations in the US and Europe. “The organisation has worked around the clock to bring these services back on line and are doing so only after we had verified increased levels of security across our networks,” said Mr Hirai in a statement. He is seen as the frontrunner to take over as head of Sony Corp.
“These illegal attacks obviously highlight the widespread problem with cyber-security,” Mr Hirai’s statement said. Later, at a news conference, Mr Hirai and two other Sony executives apologised and bowed deeply. “We apologise deeply for causing great unease and trouble to our users,” he said. PlayStation users got their first indication that something was wrong with the service when it became unavailable on 20 April. In the following days, Sony issued three brief statements asking users to be patient while it investigated an “external intrusion”, or hack. The full extent of the security breach became apparent on 27 April. In a statement posted on the official PlayStation blog, the company said user account information for the PlayStation Network and Qriocity services had been compromised following an “illegal and unauthorized intrusion into our network”. Sony said that although credit card data was encrypted and there was no evidence it was stolen, the theft of the data could not be ruled out. The PlayStation network allows gamers to download software and play with other users.